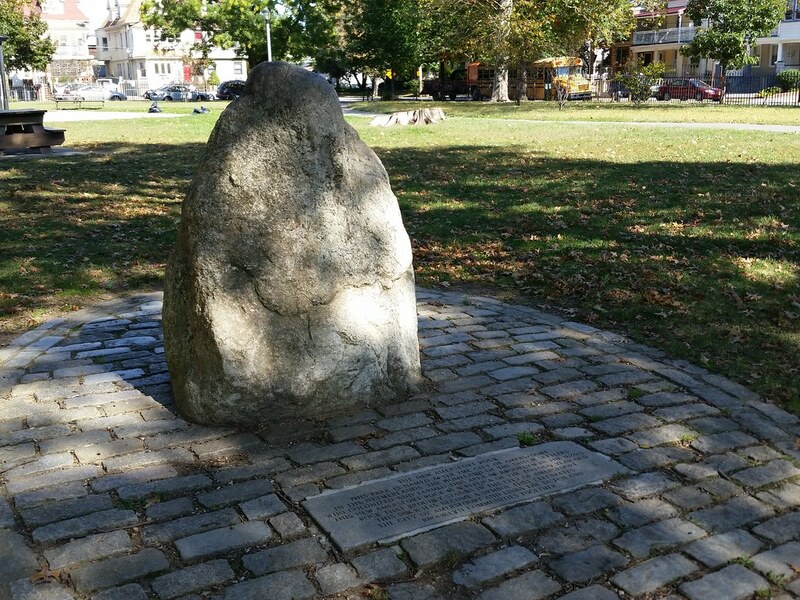 This park is named after the city of Amersfoort in the Netherlands, the homeland of the Dutch settlers who colonized and farmed this area of Brooklyn in the 1620's. This New Amersfort Rock is a replica of the 200,000 year old rock that proudly stands in the city of Amersfoort. This rock has become a symbol that celebrates the city of Amersfoort and links the Dutch and Brooklyn communities together. Hundreds of years ago, there was a boulder that sat along the road outside of town. (It was carried there by a glacier some 150,000-200,000 years ago; I assume that's what the "200,000 year old" claim on the tablet refers to.) in 1661, Everard Meyster, a local aristocrat, made a bet with some friends that he could convince the people of Amersfoort to drag the 8-ton boulder into town in exchange for some beer and pretzels. He was apparently successful; 400 residents showed up and hauled the massive rock all the way to the town square to put it on display. People from other towns started making fun of the Amersfoorters for having spent so much effort doing something so pointless. They referred to them derisively as "keien trekkers", which translates roughly to "boulder pullers". Embarrassed by this, the Amersfoorters decided to bury the boulder around 1672, hoping people would forget the whole story. The boulder was uncovered in 1903, and the people of Amersfoort, sufficiently temporally removed from the shame of their forebears, decided to display it proudly once again. To this day, it stands on a pedestal in the central part of the city. Check it out in Street View! I'm not sure how closely the Brooklyn "replica" resembles the original. Comparing photos, they seem to be roughly the same shape and color, but that might be the extent of their similarities (although it's hard to say without seeing them both in person). I don't know if someone actually tried to make the Brooklyn boulder look like the original, or if they just found a big rock and thought, "Hey, this looks kinda like that one back in Amersfoort."